Ideal to Monitor Employee PC and Internet Usage. 1. What versions of Windows does NetVizor support? 2. Can NetVizor monitor ALL users on my network from one location? 3. What if users use multiple machines during the day? 4. Some of my PC's are not showing up in the network list. 5. How do I install NetVizor over my network from one location? 6. The client is installed, but I cannot view it when I try accessing it? 7. Unwanted computers are showing up in the network list? 8. How do I generate daily activity reports? 9. Will NetVizor work in Novell Environments? 10. Does NetVizor need a server to store data? 11. Does NetVizor use a lot of network bandwidth when storing logs to a network location? 12. What happens if a network computer is taken off-site (i.e. : a company laptop)? 13. Can I reconfigure clients remotely? 14. NetVizor's Remote Installation function fails - what might be wrong? 15. NetVizor gives me an error with MSVCRT, MFC70 or MSVCR70.DLL? 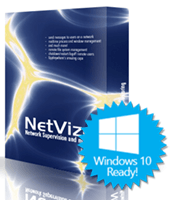 NetVizor works on Windows NT/200x/XP/Vista/7/8/Windows 10, including 64-bit versions of Windows. Not a problem. NetVizor employee internet usage monitor can be setup to log roving users as well. Please, to NetVizor's documentation for setting this up - it is very simple to do, and it allows you to view individual users, no matter what PC they use on your network. NetVizor employee internet usage monitor can be remotely installed to each workstation on your network from your central workstation, providing you have administrator access to each workstation, using NetVizor's remote installation feature. Logon scripts can also be used to deploy the NetVizor client to each computer on your network. Please refer to NetVizor's help documentation and installation guides for extensive help. 7. Unwanted computers are showing up in the network list. No, NetVizor employee internet usage monitor can store logs locally on the computer being monitored, or on a central share on a central computer. A separate server is not required for use with NetVizor. No, NetVizor employee internet usage monitor is designed to minimize network bandwidth usage. NetVizor will save logs to its specified network location every 5 minutes, and will not store logs if the computer has been idle between updates. Only new activity performed by users between updates is stored in each update, rather than re-transmitting older data along with new data. Please refer to our log storage calculator to estimate how much bandwidth NetVizor may use on your network. 6. your Windows firewall is not blocking the installation. By default on WinXP SP2/Vista the firewall may block any incoming traffic so it may be necessary to open ports 135 and 445 on your target machine for incoming traffic from your local machine. 7. the antivirus on the target computer is not deleting/preventing the NetVizor software from being installed. The NetVizor remote installation function spawns the service NetDeploySvc.exe in the target computer's System32\ folder and must be allowed to run to complete the remote installation. 15. NetVizor gives me an error with MSVCRT.DLL, MFC70.DLL, or MSVCR70.DLL?